Hickstead, synonymous with show-jumping is the host to the British Grand Prix and the only Nations Cup competition in the British Isles, it is the home of British show-jumping. Founded in 1960, Hickstead has come to represent more than just show-jumping. They have now become part of the Show Jumping Premier League, and this is where Wright Rain has come in. With a million pound redevelopment of their International Arena, including state of the art laser levelling, and a complete re-seed, they would need an extension to their existing Wright Rain irrigation system. Following a site visit and detailed design, a quote for an extension to the Underground Main, and additional aluminium pipe, sprinklers and fitti ngs was prepared. With the Underground Main coming direct from the factory, this left the aluminium pipes and fittings to be delivered by Wright Rain technical support staff, with a hands on approach they were able to assist the Hickstead staff in laying out the equipment. Stepney City is a community based (and entirely volunteer run) City Farm and Rural Crafts Centre in the heart of Stepney, in London’s East End. For nearly thirty years the Farm has been dedicated to providing the people of London with a chance to experience a taste of rural life first hand. 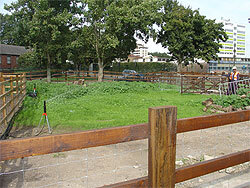 Due to recent works associated with London Underground, a part of Stepney City Farm has been moved and re-landscaped with new animal pens and shelters. The problem was then, how to get the new grass and plants established as quick as possible in the very hot summer weather, and to prevent disruption to this vital inner city resource. This is where Wright Rain came on the scene, drawing on many years experience they were able to design a fully atomated irrigation system. With detailed studies of the available water, it soon became apparent that there was a very limited supply at a very low flow rate. But through careful design, a many stationed system was chosen. This would mean that each animal paddock would be irrigated seperatly with a pause in the irrigation cycle, between each station to allow the tank to refill. 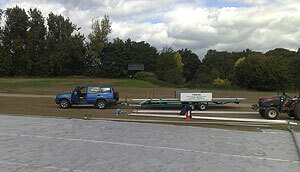 The system was delivered complete by Wright Rain staff and a days training was provided on how it should be installed. Once instillation was complete, Wright Rain technical specialists returned to fully commision the system, and provide operator training. The Democratic Republic of Congo in Central Africa is not everybody’s ideal holiday destination. However, Wright Rain Managing Director, Nigel Palmer, made the trip to assist with the irrigation systems supplied to two oil palm plantations in the centre of the country. Wright Rain provided design and technical support for the two substantial, and challenging, sprinkler systems and supplied the equipment over the last 18 months. Both systems had nearly 80 metres lift from the river to the nurseries and the large, high pressure, diesel pump units have to contend with a river water level variation of over 6 metres between wet and dry seasons. As the rivers are tributaries of the main Congo River, the water is fast flowing and silt laden, causing fast erosion of the river banks under the pump positions and producing vast, shifting, sand banks in the river. Logistics are a challenge for the estates as main equipment is delivered from Kinshasa via cargo ship up the river against the current, taking around 3 months. Smaller items can be flown to site using expensive charter planes and the new site runway, surface leveled and hardened using termite mounds. Two to three days are required to reach Kinshasa from the estates by road over the 1,000km by 4WD truck. The estates have to be self-sufficient, even to the extent of employing workers in the villages on the route to Kinshasa to keep the roads passable and supplying fuel and maintenance to the ferry of a river crossing several hundred kilometers from site to ensure that the engine starts when they need to cross. The sprinkler systems operate morning and evening to apply water to the young plants on a daily basis with sprinkler moves every half hour to apply around an 8mm application. Wright Rain have provided irrigation systems throughout the World for over 50 years and are delighted to still provide back-up and support to all their customers over that period as is expected of a progressive company in the 21st century. We were saddened to hear that Alan Rundle OBE recently passed away. Alan was a long serving member of the Wright Rain team in its earlier days and was MD and Chairman of the group in the 1970's. The attached newsletter click here from the period shows Alan being presented to HM The Queen during the 1972 Royal Show. Our condolences go to Alan's widow and family at this sad time. 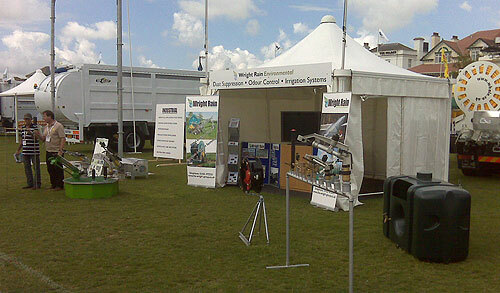 We are exhibiting as specialists in dust suppression and odour control. Wright Rain Ltd are delighted to have been awarded a substantial contract to provide a suppression system for the control of coal dust at the massive Port of Tyne complex in Newcastle. Wright Rain are please to announce that the Port of Tyne have awarded a large dust suppression contract for the coal forwarding site in Newcastle upon Tyne. The contract is one of the largest dust suppression installation in the UK and is the second system of this type that the company has provided. Bristol Port was the first and the company is sure that the Port of Tyne will be the second of a string of other installations. We would like to thank all of the customers and potential customers who took the time to come and see us at LAMMA09, it was great to see so many of you. It was a very successful show for us and we will be kept busy over the next few weeks dealing with all of your interesting enquiries before we start to get ready for the Hillhead and Royal Highland shows this summer where we hope to see some of you again. As part of a major re-generation of Palm Oil Production in the Democratic Republic of Congo in Central Africa, Wright Rain are delighted to have been awarded the contract to design and supply a Nursery Irrigation System for the first stage of a 30,000ha main project development. The whole project will take up to 20 years to complete. Wright Rain has designed the system in conjunction with the client to apply a water application of 10mm every day over the entire nursery area by hand move impact sprinkler on 1.5metre risers. 2.5ha is irrigated by 84 sprinklers in 1.6hours and 5 settings are obtained in the 8 hour working day. 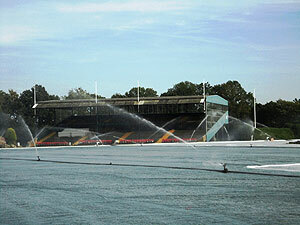 A second set of sprinklers is being moved into position whilst the other set is irrigating. This nursery will be doubled in size next year. The system is powered by a Wright Rain 156hp Perkins turbocharged diesel engined pump, with a second unit on stand-by and carrying out irrigation trials on the main production areas. 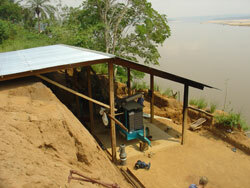 To make the system design more of a challenge, the river is over 80 metres below the nursery area. 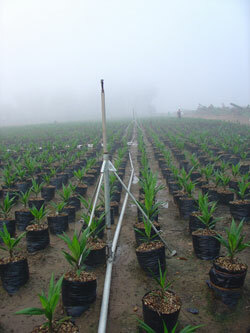 Therefore, high pressure steel piping is used for the feed to the nursery. Twin 3” aluminium lateral mains are left in position throughout the nursery and 50mm PE sprinkler laterals feed the sprinklers on tripods with quick-bayonet couplers. The photographs show the equipment being loaded into 40ft containers at the Wright Rain Depot in Southampton on their first leg of a three month journey to Kinshasa and then several weeks by ferry up the Congo River then the Kasai tributary. 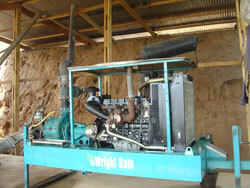 Wright Rain is pleased to have been awarded a contract for the Cameroon, West Africa, for the supply of diesel engined pump units. The units have been designed for the specific irrigation application on wheeled chasis with integral diesel fuel tanks and automatic, exhaust priming for ease of operation. Four of the units are shown being loaded into a 20ft container in the Wrights Rain yard in Southampton on the first leg of their journey to Douala. Another Wright Rain client active in Cameroon, is carrying out extensive developments of their Oil Palm plantations and has awarded the design and supply contract to Wright Rain for delivery during September. Further activity is expected in the region over the next few months.